Celtic Casino is an Irish-themed online casino that focuses on casino games with live dealers. The casino is powered by Visionary iGaming, a platform that has been at the forefront of direct-from-studio casino streaming. Celtic Casino is owned and operated by Visionary iGaming S.A. and is as much a showcase for what Visionary iGaming is able to accomplish as it is a live casino. The company is based in Costa Rica, and therefore the casino is regulated by the Costa Rica Commerce, Industry and Economy Ministry. Celtic Casino is offering a €/£ 5 no deposit bonus to all new customers! Just register a new account, “Like” their Facebook page, and contact support for your free bonus! Click Here to Visit the Celtic Casino. The Visionary iGaming platform is developed using Java and implemented entirely in a Web 2.0 framework. What this means for the end-user is that one simply connects to the casino website and begins playing. There is no download or installation process, and all necessary configuration happens behind the scenes. This approach supports nearly any modern web browser, and it does not matter if that web browser is running on Windows, Linux or Mac OS X. Note that the Visionary iGaming platform does not directly support mobile devices yet, so there is iPhone, iPad or Android app. Games are streamed to players in high quality, and there is just a single viewing window. Therefore, close-ups of a roulette wheel, for instance, are handled by Celtic Casino, and every player receives the same feed. The playing areas feature large UI elements that are easy to read and manipulate. The playing area also hosts the viewing window and the chat window. The stream can be maximized, but frequent interaction with the playing area requires it to be minimized more often than not. Classic blackjack is not available, but Celtic Casino does offer Early Payout blackjack, which uses a one-to-many setup rather than a seven-seat-table configuration. 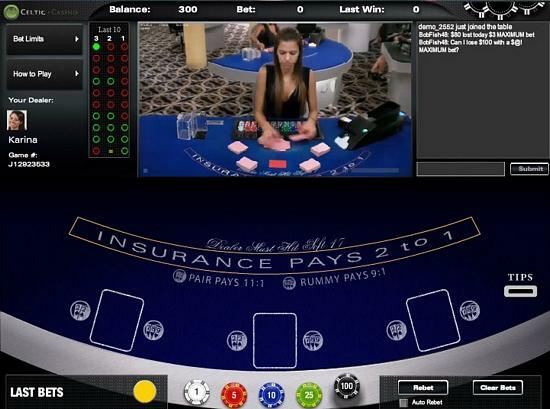 Players can play up to three hands at a time against the dealer, and the default betting range is €0.50 to €300 per hand. Celtic Casino offers European roulette, which is traditional roulette using a single-zero wheel, and this game is available around-the-clock. The casino also offers Live Irish Roulette, which is streamed from the Sporting Emporium Private Casino Club in Dublin, Ireland rather than from a studio in Costa Rica. Finally, Celtic Casino offers the “mini” version of baccarat using the Punto Banco rules, including pairs. Betting limits are the same as blackjack, and the casino offers Dragon Bonus side bets above and beyond the table limit. One of the most interesting ways that Celtic Casino differentiates itself from other live online casinos is through tournaments. Tournaments are usually hosted over a 30-day period and use a leaderboard structure. At the end of the period, the top ten finishers win a tournament prize in addition to their standard winnings during the tournament period. Sometimes these tournaments will focus on a specific casino game or variant, but often, they encompass every live game available at Celtic Casino. First off, as mentioned above, we have an exclusive €/£ 5 no deposit bonus available to all new members of Celtic Casino. To receive this free bonus, click this link to visit the Celtic Casino. Create your new player account. Then “like” the Celtic Casino Facebook page and let Customer Support know. Email the Celtic Casino customer support with the Subject: No Deposit Bonus. They will verify your account and award you €/£5 free! You can then use your free gift to try the real money games at Celtic Casino. In addition to the no deposit bonus, once you make a real money deposit, you can participate in the 50% cash back welcome promo. Although Celtic Casino does not offer a traditional welcome or first-deposit bonus, it does offer a cash-back opportunity for all new clients. This promotional opportunity is only available to clients who have never previously held a Celtic Casino account. To claim the bonus, simply open an account, make an initial deposit and then play through that deposited money. Once clients have played through their initial deposit and have net losses, the casino will award them a bonus worth 50 percent of those net losses up to €100. Therefore, if a new client made a €200 first deposit and lost it all, Celtic Casino would award him or her the maximum sign-up bonus of €100. Celtic Casino also has reload bonuses available to established clients. Note that although these opportunities are regularly and consistently available, the bonus amounts and the days on which the bonuses are available change with the casino’s promotional calendar. At the time of this review, the reload promotion was Warrior Wednesday, and on Wednesday, all clients’ first deposits of the day earn a 25-percent bonus up to €1,000. Therefore, a €200 deposit would earn a €50 reload bonus, and one would have to deposit €1,000 in order to claim the maximum possible reload bonus. Unless otherwise stated in promotional fine print, all Celtic Casino bonuses require the client to play through 35 times the bonus amount plus the deposit amount in order to clear the bonus. Prior to meeting that wager requirement, any permitted withdrawal would void the bonus and result in the loss of both the bonus and any winnings derived from the bonus. Once the wagering requirements have been met, bonuses are cashable, which means that the bonus amount is not deducted from a withdrawal. Note that Celtic Casino has a good faith rule pertaining to bonuses, and what that means essentially is that no-risk and low-risk wagers do not count toward any wagering requirement ever. Examples of low-risk bets include outside bets on roulette games, such as black/red and even/odd. Additionally, there are certain games that the casino restricts from contributing to wagering requirements entirely, and these include baccarat, blackjack and all blackjack games, all poker games, random-number-based single-zero roulette and Trent Quarante. As an online casino that focuses almost exclusively on live dealer games, Celtic Casino does not offer a traditional rewards program. It does, however, offer VIP benefits in the form of VIP tables, VIP betting limits, accelerated banking and so forth. Players who believe they deposit enough to be considered for VIP status should contact customer service and discuss it. Celtic Casino sets itself apart in two important ways: tournaments and free play. Tournaments are just another to decrease the house edge, and there is no cost to participate in them outside of the wagers one was already planning to make. Competition can be fierce, but the leaderboard just makes the whole affair a lot more interesting and entertaining. We also like that Celtic Casino lets players create an account and play its live games as much as they want without having to deposit any real money. Live dealers are available at any time, and Celtic Casino is open 24/7. VIP table limits are available upon request as well. High-stakes players who make substantial deposits can also receive a number of concessions from the casino, including private tables, particular dealers, scheduled games and so forth. Click here to receive your free £5 Celtic Casino no deposit bonus! You can find more information on the Celtic Casino from Live Dealer Sites.